Audi is writing a new chapter in its lightweight design success story. For the next generation of the Audi A8*, an intelligent mix of four materials is being used for the first time in the weight-bearing body structure – more materials than in any of the brand’s previous production models. The luxury sedan is thus once again rightfully claiming its role as an innovation driver in automotive lightweight design: Its low weight and impressive rigidity offer greater performance, efficiency and safety. In terms of its overall dimensions, an ultra-high-strength, torsionally rigid rear panel made of CFRP is the largest component in the occupant cell of the new Audi A8, and it contributes 33 percent to the torsional rigidity of the total vehicle. To optimally absorb longitudinal and transverse loads as well as shearing force, between six and 19 fiber layers are placed one on top of the other, ensuring a load-optimized layout. These individual fiber layers consist of tapes 50 millimeters (2.0 in) wide and can be placed individually in a finished layered package, with any desired fiber angle and minimal trimming of the fibers. The innovative direct-fiber layering process specially developed for this purpose makes it possible to entirely dispense with the normally needed intermediary step of manufacturing entire sheets. Using another newly developed process, the layered package is wetted with epoxide resin and sets within minutes. A high-strength combination of hot-formed steel components make up the occupant cell, which comprises the lower section of the front bulkhead, the side sills, the B-pillars and the front section of the roof line. Some of these sheet metal blanks are produced in varying thicknesses using tailoring technologies – meaning they are customized – and others also undergo partial heat treatment. That reduces weight and increases the strength, especially in areas of the vehicle that are particularly critical for safety. 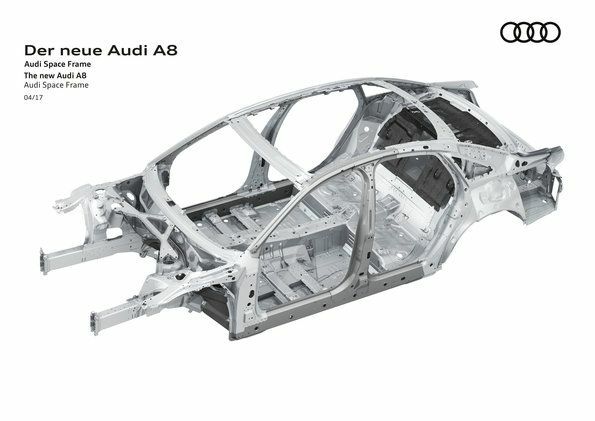 The aluminum components make up 58 percent of the new Audi A8 body, the largest share in the mix of materials. Cast nodes, extruded profiles and sheets are the elements characteristic of the ASF design. And here too the competition of materials has been driving progress. New heat-treated, ultra-high-strength cast alloys attain a tensile strength of over 230 MPa (megapascals). The corresponding yield strength in the tensile test is over 180 MPa, and for the profile alloys it is higher than 280, i.e. 320 MPa – significantly higher values than seen previously. Rounding out the intelligent mix of materials is the magnesium strut brace. A comparison with the predecessor model shows that it contributes a 28-percent weight savings. Aluminum bolts secure the connection to the strut tower domes, making them a guarantor of the body’s high torsional rigidity. In the event of a frontal collision, the forces generated are distributed to three impact buffers in the front end. The highly complex yet energy-efficient production operation uses 14 different joining processes, including roller hemming at the front and rear door cutouts. This mechanical, “cold” technology is used to join the aluminum side wall frame to the hot-formed, ultra-strong steel sheets at the B-pillar, roof line and sills. The engineers thus realized improvements of up to 36 millimeters (1.4 in) at the door cutouts compared to the predecessor model. That in turn makes getting in and out of the car even more comfortable and widens the driver’s field of vision around the A-pillar, an area that is key to safe driving. As for the “warm” joining processes, Audi stands alone among the premium automakers by virtue of its development of remote laser welding for use with aluminum. Exact positioning of the laser beam in relation to the welding edge considerably reduces the risk of hot cracking during the production process. The new process makes it possible to precisely control the penetration depth of the laser by means of the heat input. In this way, process control can immediately determine the gap width between parts being joined, and this can effectively be closed using regulating controls. The laser beam’s high feed rate and low energy use reduce the CO2 emissions of this production step by about one fourth. In 1994 it was the first generation of this luxury sedan, with its aluminum unitary body, that made the Audi Space Frame an established presence in the automotive world. Since then the company has built more than one million production cars in accordance with this design principle, and it has been continually building upon its know-how in the use of materials and joining techniques. This car is not yet on sale. It does not yet have type approval and is therefore not subject to Directive 1999/94/EC.